Now that virtual reality (VR) has proved itself as a mainstream form of entertainment - and not just an over-priced tech fad for early adopters - there are lots of different ways to get your home kitted out for the best of the best VR experiences. But the problem is that picking a VR headset isn’t easy, especially now there are more and more headsets coming to market with many offering different kinds of experiences, different kinds of hardware, different requirements and a lot of great deals to confuse matters even more. The good news for those serious about VR is that the premium headsets built specially for PC gaming are now much more affordable thanks to permanent price drops. The bad news is now that these discounts make it even trickier to choose the best VR headset that’s right for you. Then there's the whole new category of standalone VR headsets. 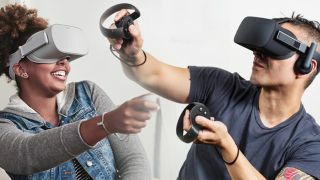 The Oculus Go led the charge, and in September Facebook revealed its successor, Oculus Quest. Unlike the Go, the Quest will offer six degrees of freedom tracking, and will launch with a raft of new games early next year. The VR space is also expected to get even more of a shake up after CES 2019, with HTV teasing the HTC Vive Cosmos, a VR headset that is wired but is also expected to work with your mobile at some point too. We’ll fill you in on more Cosmos details when we get them, but this could be a headset that transcends the wired and wireless space and makes VR more accessible than ever. But it’s earlier days for the Cosmos, so let’s stick with the VR headsets you can get your hands on - and head into - right now. Check below to see our choices and explanations for the best VR headsets available now in depth, but it's important to note that permanent price cuts have brought the so-called traditional VR headsets more closely in line with one another. Each headset has its own distinctive strengths and weaknesses, and if you're not aware of these before you buy, it could be a very costly mistake to make. But that's exactly why we put this guide together. And, if you want less expensive fare, our guide also includes a few mobile VR headsets for your consideration too. Now, however, the gap has narrowed. Today the Oculus Rift matches much of the Vive's functionality and includes two motion controllers of its own. But the Vive still has the edge over the Oculus because, for our money, the room-scale tracking is that much better. The feature allows you to walk around a space that's 4.5 x 4.5m big, adding another dimension to the feeling of presence that you experience while using it; you're not just pressing up on an analog stick, you're using your legs to walk. That's if you have enough space in your real room, of course. The headset itself contains two 1080p screens which makes for a very crisp image. Unfortunately it's not quite high-resolution enough to prevent you from being able to discern individual pixels when you wear it, and the HTC Vive Pro, with its 78% increase in dots per inch, offers a much sharper screen in addition to built-in audio, which the original Vive lacks. Though it's still more expensive than Oculus Rift, the HTC Vive Pro has a few shortcomings that don't quite justify its high price tag. For the regular user who doesn't have the funds to buy an HTC Vive Pro, the HTC Vive offers a still-excellent experience for less cost. Simply put, Oculus Go signals a new era for virtual reality, one that doesn't require a smartphone or PC to run excellent experiences. But forget the grandiose statements – you want to know what it's actually like to use, right? With impressive visuals, limited screen-door effect and a comfortable fit (one that's front-heavy, to be sure), you're in for loads of fun with the Oculus Go. Its content library is already quite large with over 1,000 apps, games, movies and experiences available at launch, and that should only grow because the headset is compatibility with Samsung Gear VR content. The headset comes in two storage options, 32GB or 64GB, so you can take your pick for how much memory you'll need. Oculus Go isn't perfect – in addition to sitting heavy on the face, light leaks through the bottom (right where your nose is), which could prove anywhere from mildly annoying to downright distracting to you. What's more, its battery-life-to-charge-time ratio isn't ideal, but you still get around two hours of gaming on a full charge. If you're looking for a fun, quick and easy way to get into virtual reality, Oculus Go is your best bet. The experience is better than mobile VR headsets that require a smartphone to use, while at the same time being more affordable than PC-powered headsets. Its successor, Oculus Quest, promises even better untethered performance, and is due for release in early 2019. Early signs are very promising, and we look forward to putting it through its paces when it launches along with a wealth of new, specially designed titles. There's no getting around the fact that in order to run either the HTC Vive, HTC Vive Pro or the Oculus Rift you need a pretty substantial gaming PC, which is a hefty investment for most people. That's not the case with Sony's PlayStation VR, which requires little more than a PS4 console to run. Considering the huge difference in power between the PS4 and PC, the PlayStation VR is a surprisingly capable virtual reality headset. Its refresh rate is nice and responsive, and we've had no problems with the reliability of its head-tracking. Thanks to Sony's backing, the selection of PlayStation VR games is also impressive. There were dozens available at launch, and many more have followed over its first year on sale. Sony has addressed one of our biggest complaints with the PlayStation VR – that its accessories are sold separately – by offering a variety of packs and bundles with devices like the PlayStation Camera included. However, PlayStation Move controllers, while are included in some bundles, aren't in every one. It's seen some decent upgrades over the years thanks to the inclusion of the Touch controllers (which we'd argue are slightly superior to the Vive's), and a couple of key price drops. Yet, compared to the HTC Vive's room-scale technology, the Rift isn't quite as good. The reason is that while the Vive is designed to let you walk around in any direction, by default the Rift has you place its two sensors in front of you. This means that the tracking is more single-sided, and you can't let yourself get turned around, or else the sensors will lose track of you. The experience is a bit different when you add a third sensor to the mix, but if you're comparing apples-to-apples, we still believe the Vive does room-scale a heck of a lot better. But the HTC Vive Pro perks don't end there. There's also the addition of built-in headphones and new nose guards that do a better job of blocking out light than the HTC Vive. All told, the HTC Vive Pro is a clear evolution in both design and tech on the older HTC Vive. However, for all its shiny new specs, new navy blue color and a game library that's sure to grow, the HTC Vive Pro has some serious flaws. The main one is obvious: it's expensive. It costs the same as the HTC Vive did at launch, and it doesn't come with any accessories in the box. That's right: you'll have to buy controllers and sensors separately. Because of its price, its challenging setup and the fact that the still-excellent HTC Vive is now much less expensive, the HTC Vive Pro is likely best suited for VR enthusiasts and arcade owners. It's still an awesome headset, just one that's probably not for everyone. Samsung Gear VR has always been a respectable smartphone-powered VR headset, but now that it has a motion controller, it's taken things to the next level. Compatible phones naturally include the Galaxy S8 and Galaxy S8 Plus, as well as the Galaxy S9 and Galaxy S9 Plus (if you have the latest Gear VR headset). The included motion controller has undertones of the HTC Vive controller design, with a touchpad and trigger button, which aren't bad things. It's with the controller that the Gear VR really takes off, allowing you to interact with the VR worlds in front of you in a way previously impossible without it. Of course, being powered by a smartphone, the headset's performance is entirely dependent on the phone you've slotted in, though in our experience this isn't a problem considering the power behind Samsung's higher-end handsets. However, if you're using an older Galaxy phone, your experience could be noticeably different. If you own an Android phone (that's not necessarily a Galaxy) and want to get into virtual reality without spending a fortune on a headset and PC set up, then consider the Google Daydream View (2017) a viable option. What makes this headset compelling is its price; it's less than $100 / £100, and a recent discount has made it even cheaper, at least for the time being. It's also an easy headset for just about anyone to use. Not only does it require little on your part aside from installing an app on your phone, but once you're inside the VR world, navigating to and fro is easy with the included controller. You won't get the deeply immersive worlds of a higher-end, PC-powered VR headset with the Google Daydream View, but you will get a device that's made of a nice material, works with many of the best Android phones, and, did we mention how inexpensive it is? The content on offer isn't very compelling – there's not a ton to draw you back for multiple play sessions – but it is varied and offers a little something for everyone. This isn't the best VR headset on the market, by far, but it is an easy way to get into VR for Android phone owners. And that, really, could be all you need to know. HTC Vive Pro vs HTC Vive: should you upgrade to the high-end headset?